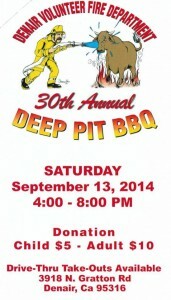 The Denair Volunteer Fire Department is holding their 30th Annual deep pit BBQ this Saturday, September 13, 2014, from 4:00-8:00 pm, following the Denair Farm & Family Festival. Drive-Thru take-out dinners are available so you don’t even have to get out of your car! This dinner is preceded by 29 years of accolades as the best fund-raising meal in the valley. Donations are $5.00 for a child’s meal and $10.00 for adults. The event takes place at the Denair Volunteer Fire Department, 3918 North Gratton Road, Denair. 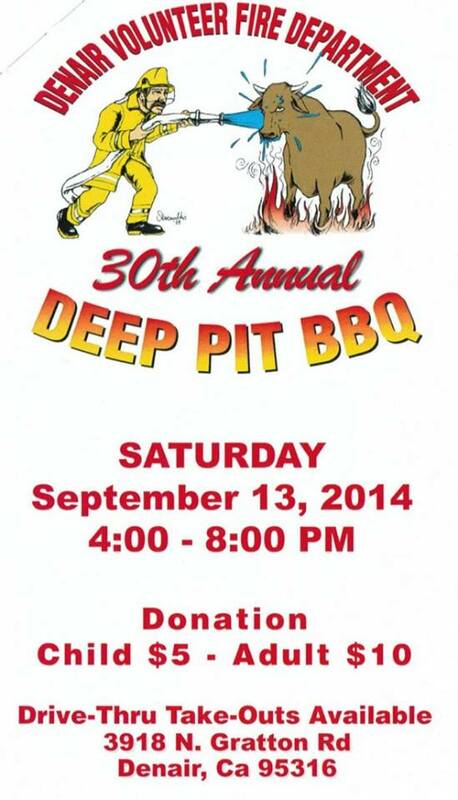 Posted in News and tagged BBQ, deep pit, Denair Volunteer Fire Department. ← Denair Farm & Family Festival Needs Your Help!